This journey through Arizona’s history blends indigenous heritage with a rugged off-road ride. 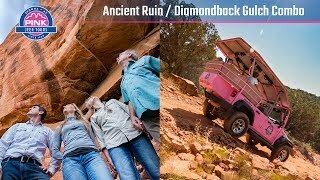 The Ancient Ruins and Diamondback Gulch Combo Tour is a remarkable adventure with both an exciting 4x4 trek and an up-close look at a time when the Sinagua people called this area home. Your Certified Interpretive Guide will meet you at the Pink® Jeep® Tour Plaza in Sedona. You’ll climb aboard a custom-built, open-air Pink® Jeep® Wranglers and settle in for a true Arizona experience. Wear comfortable shoes, as there is a 30-40 minute walk to reach the Honanki Heritage site once you arrive at the Ancient Ruins site. At the end of the tour you’ll journey back through the forest to Sedona, where Arizona’s rich history lives on. No matter where your next Pink® Jeep® Tour takes you, you’ll never forget the excitement of climbing the red rock trails and the mystique of the Sinaguan civilization. Brian was great! Very knowledgeable and able to convey info to diverse group. The ruins were a highlight of our trip. Wonderful experience!!! Learned a lot and had a great time. Mike was amazing!!! Can’t say enough about him and our tour!!! Was a little nervous about my 83 yr old mother in law joining us but Bonnie put me at ease and made sure she was totally taken care of. The tour was informative, fun, adventurous, and great for our family. We loved our tour! Our guide, Bonnie, was very knowledgeable about the history, geology, flora and fauna of this very unique environment. It was amazing to be able to get to the back country with someone who knows all this history. So much better than we thought it would be. Plus, my 83 year old mother was one lucky passenger with Bonnie at the wheel. She took such good care of my mom. It made me feel great that my mom was able to do this adventure because Bonnie made it possible for her. Thank you from the bottom of my heart!